Departure to the Fertile Békaa Valley. The Phoenician inscriptions of 1400 BC have described the Bekaa as the Place for the Gods. The many invading armies and trading caravans that passed through left traces of their presence, which can be seen in a host of small sites around the valley, but most magnificently at the Umayyad city of Anjar and the gorgeous temples at Baalbek. The Bekaa Valley has always been an agricultural region, fed by the Nahr al-Aasi (Orontes River) and the Nahr Litani. In Roman times, this grain-producing area was one of Rome’s ‘breadbaskets’. Today, deforestation and poor crop planning may have reduced the fertility of the land, but the valley’s wines are famous throughout the region and are gaining global renown. Combining temple tour with wine tasting is the way to get the best of the Bekaa Valley. Stop at Chatura for a short rest and coffee break. 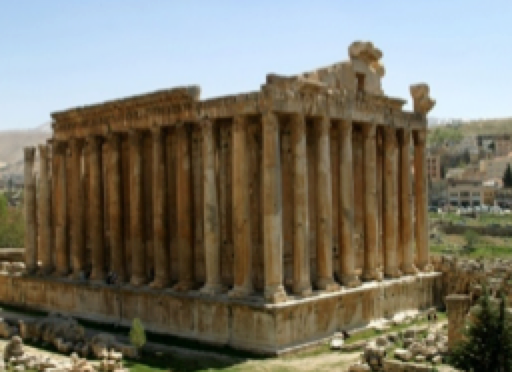 Drive to Baalbeck to visit Lebanon's greatest Roman treasure. The largest and most noble Roman temples ever built, they are also among the best preserved. Towering high above the Békaa plain, their monumental proportions proclaimed the power and wealth of Imperial Rome. The gods worshipped here, the Triad of Jupiter, Venus, and Mercury, were grafted onto the ind igenous deities of Hadad, Atargatis, and a young male god of fertility. The temple complex of Baalbek is made up of the Jupiter Temple and the Bacchus Temple adjacent to it. A short distance away is the circular structure known as the Temple of Venus. Only part of the staircase remains of a fourth temple dedicated to Mercury, on Sheikh Abdallah hill. Arrival to Zahle Town to Ksara Winery. The visit includes a visit to the caves, wine tasting and then lunch. Château Ksara reserved Lebanon's rich wine making heritage for over 150 years, laying down the foundation for Lebanon's modern wine making industry. Founded in 1857 by Jesuit Priests who produced the country's first dry red wine, Château Ksara is Lebanon's oldest, largest and most visited winery, attracting some 40,000 visitors.